Model Analysis for Excel is a tool that can analyze multiple scenarios for a number of selected variables of and Excel model as well as to perform sensitivity analysis. 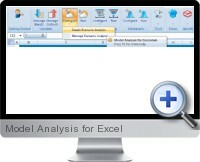 Analyze various scenarios of an Excel model for selected input variables. Analyze the impact on selected variables when other variables are changed. Evaluate if creating a new line of products will increase profit. Analyze whether making a specific investment will be profitable. Decide among multiple investment alternatives. Analyze multiple scenarios and how sensitive certain variables are. Multiple Scenarios Manager: Manage Scenarios, Scenarios' sheet wizard, Combine scenarios, Manage Inputs and Outputs. Sensitivity Analysis: Sensitivity Analyzer Wizard, Spider method, Tornado method, Tables method, Administrate Sensitivity Models. Goal Seeker Analysis: Spreadsheet Goal Seeker Wizard, Apply Goal Seeker in Scenarios' Sheet. Monte Carlo Simulation: Apply risk and decision analysis to make decisions for uncertainties in trends and fluctuations. Miscellaneous: Search Inputs/Outputs, My favorites, Toggle Settings.